Mild green chiles oozing melted cheese, encased in whole grain flour tortillas generously spread with creamy spicy refried beans, all moistened with rich deep-red enchilada sauce. 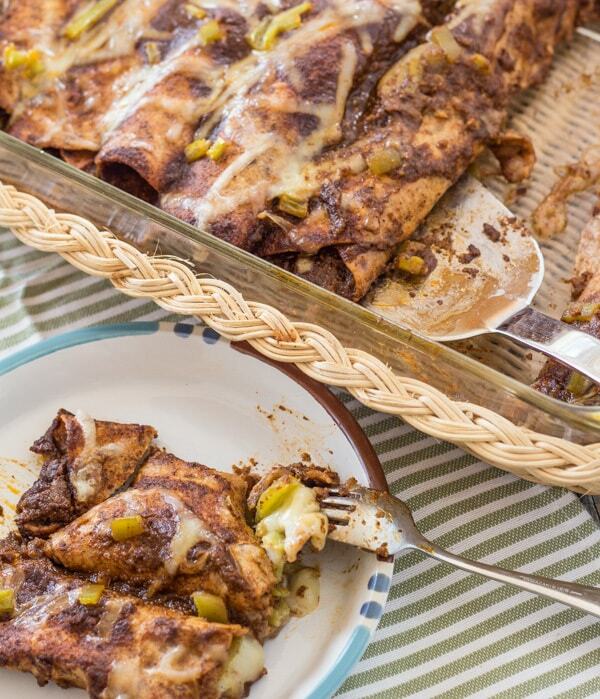 Let’s talk soul-satisfying comfort food–hot from the oven chile relleno enchiladas! 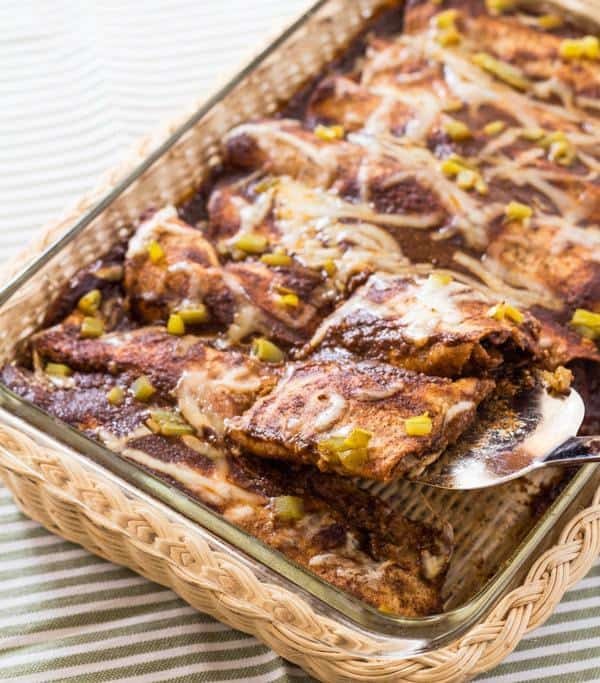 Click here to PIN Easy Chile Relleno Enchiladas! Can’t decide between enchiladas or burritos? Make enchurritos. They’re easy to put together and always a hit! 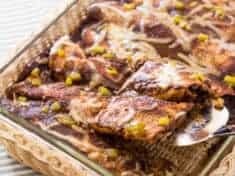 All you do is spread spicy refried black beans on flour tortillas, roll them up with cheese-filled green chiles inside, drench with red enchilada sauce, and bake until piping hot. Robbie and I could eat homecooked Mexican food every dinner for the rest of our lives. Seriously. Even more so when we’re in Mexico, where this month we’re renting a house in Los Barriles, Baja California Sur. Today got to thinking about the chile relleno enchurritos I posted here a couple of years ago. Seems like a perfect time to bring them to the forefront again. It’s the same delicious recipe I’ve been making forever with added nutrition information. In Spanish, “enchilada” means “chili-sauced”, so Mexican filled and sauced corn tortillas are known as enchiladas. Relleno means filled, so cheese stuffed chiles are rellenos. Fill flour tortillas with something yummy, they’re burritos. So, when we roll a cheesy chile relleno into flour tortillas, we get chile relleno enchurritos! These enchurritos come together quickly using canned green chiles and canned black beans. Even easier, finish with purchased enchilada sauce. Chile relleno enchurritos make an excellent busy-day dinner casserole for family or parties. 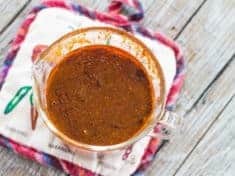 Now when I have the time or I’m thinking ahead, I’ll make my own authentic enchilada sauce. For today’s recipe these enchurritos got sauced with my go-to quick homemade enchilada sauce! Use whole grain flour tortillas for the fiber and nutrition. Ortega canned green chiles are sturdy and don’t easily split when stuffed with cheese, like some canned chiles I’ve tried. If your peeps like spicy food—stuff the chiles with pepper jack cheese instead of Monterey Jack. Prep ahead: Roll the tortillas with cheese-filled chiles in the morning or the night before. 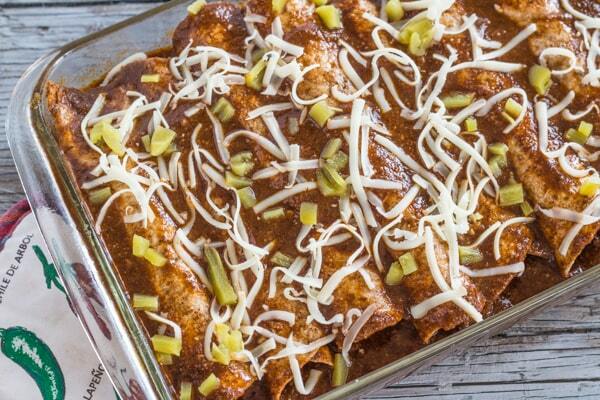 Pour the enchilada sauce over your enchurittos just before they go in the oven. Easiest–buy a can of vegetarian refried beans—black beans or pintos. Puree black beans in the food processor with salsa, chili powder, and cumin, as in this recipe. Where did enchurritos come from? In the old days, during Park City’s evolution from a declined mining town into a world famous ski resort, there was a really good Mexican restaurant at the bottom of Main Street. Whenever we went there for dinner, I had their vegetarian enchurritos. Now, long after the restaurant ceased to be, I’m rolling up a savory memory, these homemade chile relleno enchurritos. Green enchiladas with spinach and arugula. 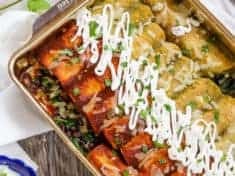 Amazing spinach and black bean enchiladas. If you make these enchurritos and love them, please consider leaving a blog post comment. Your comments help other readers learn more about the recipe. Using flour tortillas, canned chiles, melty cheese, mashed black beans, and a quick enchilada sauce, these enchurritos come together in a jiffy--and they are huge hit with everyone! Drain the green chiles and place on plates. Insert a strip of cheese in each. Spread each tortilla generously with the black bean mix, almost to the edges. Brush a 9 x 13-inch pan with oil, or spray with cooking spray. Pre-heat oven to 350°F. 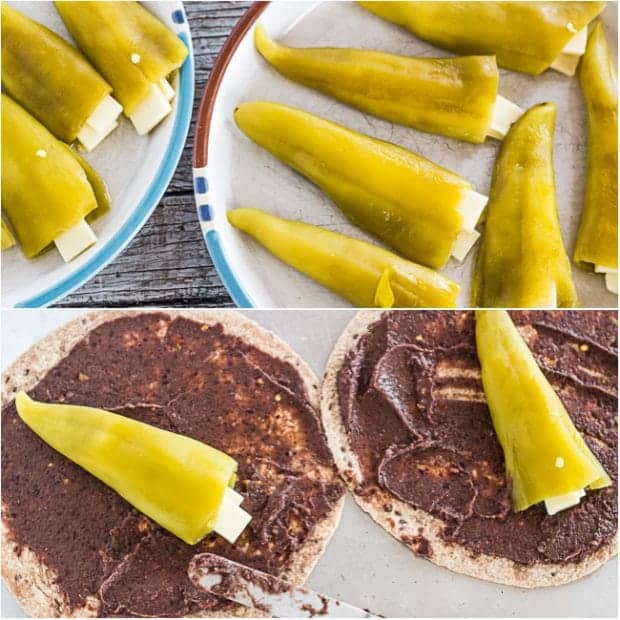 Roll each bean-coated tortilla around a cheese-filled chile, then place in the prepared pan. (see note) Pour enchilada sauce over the filled tortillas, making sure the edges get plenty of sauce. Garnish with diced chiles and a sprinkle of cheese. Bake until heated through and sauce begins to bubble, 25-to 30 minutes. Instead of making your own black bean spread, use a (15-ounce) can of refried beans, black or pinto. That looks so good! I make stuffed peppers with cheese this way in the summer when I have tons of pepper. Add the tortillas and the sauce is something that would make it a really hearty meal.